If your question isn't answered here please contact us. Is Hot Yoga right for me? Do I want to improve muscle tone? Do I feel tension and stress in my shoulders or neck? Do I need to recovery faster from my marathon? Do my joints ache from all my other fitness routines? Do I want to turbo charge my other workouts? This is the most common misconception that prevents people from coming to a yoga class. Yoga is not about how flexible you are. It is about stretching your body and spine in all directions. All that matters is that you try the right way, do the best you can and breathe normally. 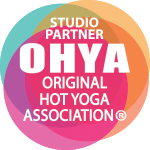 No matter what your level of fitness, Original Hot Yoga class is very challenging. Each posture combines flexibility, strength, and balance to work the whole body from your bones to your skin. With persistence, patience, and dedication, you can lose inches, and develop muscle tone and strength that might never come from other forms of exercise. There are unlimited benefits to hot yoga. It can reduce stress, increase blood circulation, and improve strength and flexibility. Regular practice (at least three times per week) can reduce the symptoms of many chronic diseases (e.g., arthritis and thyroid disorders). It also promotes relaxation. The room is intentionally heated to warm the muscles and allow deeper yet safer yoga work. The heat also heals and helps prevents injuries. It also promotes sweating, which flushes toxins from your body. I feel nauseous and dizzy during class sometimes. Is this normal? What should I do about it? Usually the problem is not drinking enough water or we have not received proper nutrition, or eating too soon before class. Be sure to eat a good meal 4 hours before class and to hydrate properly. Also be sure to get enough electrolytes and minerals. Some suggestions are fresh vegetable juices, coconut water and mineral supplements. Try ‘E3 Live’, available frozen at Whole Foods. We recommend attending class at least 3 times a week to receive the maximum benefits of the series. For life changing results, come 4 or more times per week. If you can’t come that often, it’s ok, it just may take longer to get the results you want. Anyone who is healthy enough, per their doctor, to do a 90-minute exercise class in a hot and humid room: About 105 degrees and 40% humidity heat. Children over 14 may attend if they are 100% willing and able. Do not start Bikram Yoga while pregnant. We’ll see you after you have the baby! Children over 14 may attend any class if they are 100% ready and able. Please email Val for more info. Everyone takes to a hot yoga class the first time differently. Please pace yourself, do the best you can, and BREATHE through your nose. The heat takes some adjustment, but it is also what provides the magic for so much detoxification and healing. Coming regularly may soon make you crave the heat. All of our teachers are highly trained Certified Bikram Yoga Teachers. Most of our teachers have at least 2 years of teaching experience and many have over 5. Val Sklar Robinson, the owner and director of Hot Yoga Pasadena has been teaching for over 17 years, and Jeff Rangel, for over 12 years. Jeff is also a Southern Californian, USA Yoga Federation Champion. Breathe normally through your nose. Listen to the instructors so you can try the right way. They will guide you step-by-step through each pose. Do the best you can! Try to come every day of your intro month, and if not, come as often as you can. Definitely try to come within 24 hours of your first class. All students need to have a yoga mat and a large towel (washcloth optional). We also rent mats and towels for $3 each. We also strongly recommend a bottle of water. We also have a filtered water machine to fill your reusable water bottles. We also sell water, coconut water and Kombucha. You must shower the day you attend class. Men: shorts or a bathing suit (some men wear shirts, but it is not recommended). Women: exercise top and shorts or leggings — dress as lightly as possible. NO COLOGNE, PERFUME, SCENTED OILS, or MENTHOL SCENTS. NO residual smoking smells. Anyone who is healthy enough, per their doctor, to do a 90-minute exercise class in a hot and humid room: About 105 degrees and 40% humidity heat. Children over 14 may attend if they are 100% willing and able. Do not start Hot Yoga while pregnant. We’ll see you after you have the baby! Thanks for supporting an independently women owned business serving our community since 1998. 100% of your investment stays in our studio. There are no affiliation or franchise fees paid to any other person or entity. Best Yoga Program 9 times! Thanks Pasadena!